ClearView was demonstrating the new range of ABIT access control IP door controllers at IFSEC. Using the latest in electronic processing and networking technology, It is one of the most cost effective systems on the market. 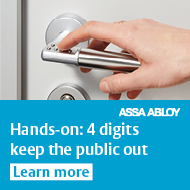 Three controller models are available for managing 2, 4 and 8 doors (ACX-12, ACX-24 and ACX48). Each has an in-built web-server for remote network management. Firmware upgrades can also be deployed remotely. The software can manage people and vehicles on a single platform. They also offer sophisticated visitor management and badge production facilities.